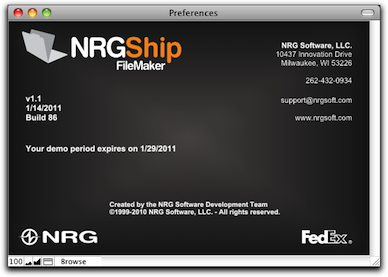 NRG: Mac & FileMaker Shipping Software :: How do I find out what the version and build number is for my NRGship FedEx solution is? How do I find out what the version and build number is for my NRGship FedEx solution is? To find the version and build number in your NRGship FedEx for FileMaker, open the solution, open preferences, and then from the Scripts menu, select About from drop-down. This will display a window like the example below, where the version is 1.1 and build is 86.